Any pattern purchased between the 14th of July to the 21st of July 2006, will be delivered after the 21st. Thank you for your understanding. 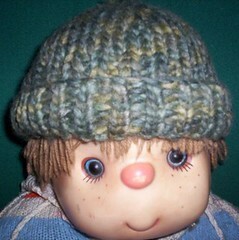 Harry: a top-down hat knit-to-fit your measurements in any yarn you choose. Since this hat is my most successful self-designed thing ever (I didn't have to rip back, everything went to plan, it fitted the recipient and he loved it), I've decided to offer it for sale. It's knit from the top down using double-pointed needles or two circular needles and it's knit to fit your measurements. The hat shown above used just 76m/84 yds of a yarn that worked up at 9 sts over 4"/10 cm. 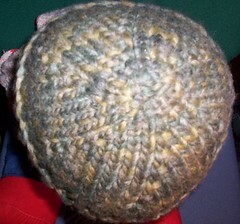 I used 2 balls of Patons Funky Chunky yarn (38 m/42 yds per 50g/2oz), for the model to fit my adult brother's head. A larger (or smaller) hat will need more (or less) yarn than that stated. If you use a thinner yarn, you will also need a greater amount of yardage. 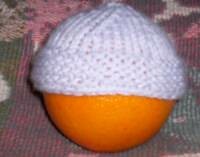 The hat shown above is for a premature/preemie baby and is knit in a DK (double knit) weight yarn on US7/4 mm needles. It took me a little under three hours to knit this. The pattern costs just £1 (that's around US$1.80). Everything money-wise is dealt with by PayPal, but the actual pattern delivery (by email) will be done by me becuase I don't know how to do the whole secure website thing. It will be delivered electronically in PDF format. If you want a hard copy, or have problems viewing PDFs, contact me and I see if I can work something out (no promises though!). Please bear in mind any time difference and that when you order I may be asleep! If you don't hear anything within 48 hours, please email me using the link in my sidebar, just to check I haven't fallen off the face of the Earth! NOTE: the model is my "Cabbage Patch" style doll. He doesn't complain when you need to keep taking pictures and he sits still!